It's an archive of sorts, although there are no dates and times. Kite flying is timeless, don't you agree? I trust there is plenty in here to educate, inform and often entertain! 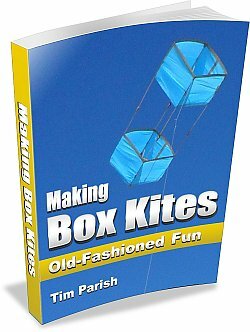 Try the Making Box Kites PDF, if you are interested in making this kite for yourself. Handy for working offline or from printouts. These short flight reports once appeared in the site blog page - that's the one you enter via the 'what's new!' site navigation link. It would have been a great idea to check each kite for airworthiness, before venturing out. One of them hadn't been flown in years! That was the Dowel Box for Moderate winds, which is held together with strips of electrical tape. Good for quite a few months, but age and heat eventually take their toll. A simple rip-off and re-tape procedure is then required. The first Dowel Box soon revealed it's flaws. Loose tape and free spar-ends everywhere, so it was not going to fly today. So in the end, it was back to the trusty Multi-Dowel giant of a box kite. Lively gusts were charging through the reserve so the conditions seemed flyable. A lone pelican soared around in weak lift, under the ragged grey cloud cover. Meanwhile I spent nearly 15 minutes carefully rigging the big Box beside the car. Handy wind shadow you see. The packing tape and drop-sheet plastic wasn't in pristine condition but it seemed good to go for today. After just a couple of unsuccessful launch attempts, I got some more line out. 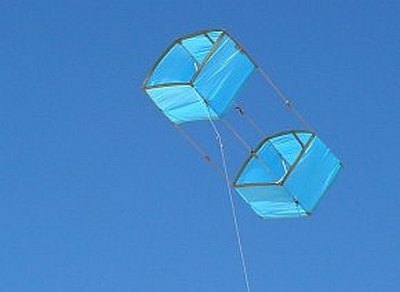 Soon the big blue Box kite was surging from side to side in moderate gusts and finally nosed up into smoother air. It was a pleasure seeing the large kite fly steadily at about 150 feet off the grass on a tight 200 pound line. However, after about 8 minutes the breeze proved insufficient to keep the kite up there. It wasn't long before another gust allowed the Multi-Dowel Box to ride high once again. This time, after another 8 minutes or so, I decided to take the kite down deliberately, since school pickup-time was approaching. Not a bad little outing, despite spending roughly the same amount of time rigging as the kite actually spent in the air! Having been through a phase of leaving the big Multi-Dowel Box alone for a while, due to it's tedious rigging needs, I reached for it once again a few days ago. Moderate gusts were teasing the tree-tops outside and for some reason the thought of flying the big Box just appealed. Down at a nearby reserve, the rig was nearly complete when I noticed a ripped leading edge near a main spar on the lower cell. A small problem which was soon fixed with some spare packing tape from the bag of such things I always carry. Rig complete, it was a pleasure to see the big squashed-box design sitting there on some bark chips, ready to take to the air. Easier said than done unfortunately - in the meantime, the wind speed had lessened somewhat! For over half an hour I tried towing the kite up in gusts, on varying lengths of 200 pound Dacron line. On a few occasions, the big box contacted slightly stiffer breeze strengths that tightened the line but didn't quite prove enough to maintain height for more than a few seconds at a time. Finally, with some darker cloud cover moving overhead, the average wind strength crept up a little. It was most satisfying to urge the big Box higher and higher, letting out line carefully whenever a bit of extra tension came on. For several minutes, my earlier labors were rewarded as the kite moved about gracefully at a fairly steep line angle. Not the most relaxed flying session overall, but it would do for now! This outing was a little nerve-wracking, since dark low clouds were going over, with the threat of strong wind gusts associated with them. At least I had detected no lightning strikes on the weather radar, which shows strikes during the past 30 minutes. Perhaps fortunately, the Fresh Wind Barn Door kite had go back in the car after I discovered that one of the sail corner ties had almost failed. So out with the mighty Multi-Dowel Box kite! On previous attempts at KAP (Kite Aerial Photography) with the Box, I had concluded that it just wasn't practical with Box kites. But today proved that if you operate the Box in the top half of its wind range instead of the lower half, there are no problems at all! With an extra 15 or 20 kph of wind speed, launching on a short line was effortless. Well, aside from the hefty tension in the line that is! The camera rig lifted off fairly gently and controllably just like with any other lifter kite. Just one downside of doing KAP with big box kites - the setup time. For my Multi-Dowel Box, it's around 10 to 12 minutes to rig and check that all the lugs line up. The big box kite flew smoothly most of the time, on 90 meters (300 feet) of line. Anchored around some square metal fence posts which had smooth rounded corners. The windy periods gave the kite a real work-out, pushing it to high line angles and upsetting its flight at times with turbulence and sudden down-drafts. These showed up in the video as wild oscillations to 45 degrees each way! The soundtrack captured the noise of the wind whipping past, calls from passing birds and the urgent note of a soccer umpire's whistle from a neighboring field. Watching the kite was not particularly relaxing... I half-expected something to give way, starting my Pentax Optio on a rapid descent to the stones below. This was only the second outing where imagery was taken in the down-wind direction. Hence no flying line in the images, which is a bonus. Unfortunately, I somehow misjudged the position of the top shoelace tie. Result: about 90% of the stills and video featured stormy cloudscapes and precious little landscape or buildings! I have managed to extract just one movie still which features the intended photographic target - the big Noarlunga shopping complex here in Adelaide, S.A.
Another problem was the sun light which was blocked by cloud most of the time. Such is KAP. At least the panoramic shots of the flying field ended up almost perfect, with the aid of a small solid chair on which the appropriate camera angles were marked. Down at Knox Park in Morphett Vale the wind was fresh and gusty. Thermals were being sucked into puffy white Cumulus clouds all around. This was going to be interesting! In no time, after a few wild excursions from side to side in turbulent air, the huge blue box kite was straining away at high line angles. Well, high for a Box kite anyway! A handy tree provided a good anchor point. The rough bark ensured that just four turns of the flying line were holding the kite fast, despite its best efforts to pull the tree out by the roots. Exaggerating just a little there. A few still photos were taken - with gloves on. The genuine-leather gloves were a Christmas present which will probably never be used for their intended purpose of weight-lifting! The finger tips are removed which allows such things as photography and kite-setup. So handy. It was wild up there but I'm happy to report that the Box kite performed flawlessly. One time I measured a peak line tension of 10 kilograms (22 pounds) while at other times sinking air put the kite into free-fall on a slack line. Then it happened. Ideal wind speeds combined with a hefty up-draft saw the kite floating about on its face, almost vertically above the tree to which it was anchored. The kite disappeared for a while since I was sheltering from the sun near the trunk, looking up through the foliage. Then the kite nosed around downwind to one side and I had visions of it locked in a nose-dive all the way to the ground. But no, it soon righted itself and climbed right back up. Love this kite! A great flight all up, on about 80 meters (260 feet) of line. Amongst the trees the wind meter recorded an average of 16 kph and a gust to 22 kph. Higher up, it would seem the kite was hit by gusts in the mid-thirties with up-drafts adding to the line tension at times. I found myself taking a half-wrap of flying line behind my backside - using the jeans fabric as a brake pad! In this way I managed to gradually let out line to 60m (200ft) and eventually 90m (300ft). Due to the steepness of the line angle, this necessitated an adjustment to the ... erm ... brake pad location. The big Box kite surged around the sky for an hour at least, the 200 pound Dacron tied off to a small tree among the taller ones. The sky was cloudless and the gusts ferocious. Every time I heard the trailing edges flutter it was a sign that the kite was experiencing wind speed above 30kph. Perhaps well above, judging by the 8kg peak tension measured by the spring scales! At one point the kite dipped below 100 feet for a little too long and started to drift earthwards. I was measuring wind speed at the time and rushed back to pull some line in. The kite was just meters off the grass. Finally, after a brisk take-in of 15m (50ft) of line, the big blue beast caught another gust and was soon on a tight line once again, up around 270 feet over the field. There's nothing like a really big Box kite to thumb it's nose at anything the wind can throw at it. Except perhaps, a lack of wind! Heading down towards the coast it was feeling like the light-wind Rokkaku might be the selection for today. However, strangely, the breeze was quite fresh at the school field. And it stayed that way until sun-down, with dark banks of cloud scudding overhead. The large school building on the Western side of the field was a handy wind-break. Just what you need when rigging the Multi-Dowel Box kite! No KAP this time, just a more relaxed flying outing. After two or three short flights which sank out to the grass, the kite was at last lofted into the smooth fast air flowing over the building complex and surrounding trees. Turbulence from these obstructions was present at a surprisingly high altitude, between 50 to 100 feet. I guess that could be put down to the fast wind speed. The huge blue Box kite flew as smoothly as I have ever seen it. Even compared to the beach at Fort Glanville, with an on-shore breeze. It seemed the breeze was around 25 to 35kph, exactly as forecast. Winding a few turns onto the hook and then taking the strain, the kite turned out to be pulling between 2 and 5 kilograms most of the time. A hefty gust popped the scales up to 8kg momentarily. This seemed to correspond with a distinct ruffling sound from the drop-sheet plastic sails. Later, with the scales off, the kite started making the same sounds again so I knew what was happening up there. The long main spars took on gentle curves as the horizontal cross-pieces took the considerable strain of the cells attempting to fold up flat. No wind meter readings. I just didn't bother with it this time. Tsk tsk I hear you say... Anyway, a magic flight from the big kite on 75 meters (250 feet) of line. Line angles touched 60 degrees a few times. Good fresh winds this afternoon promised a chance to try KAP (Kite Aerial Photography) with the Multi-Dowel Box kite. I tried a different reserve this time, which is very large and square. Hence any wind direction can be accommodated on a long line. However, on getting to the upwind edge of the grassed area, it turned out to be a huge wind-shadow. A line of tall trees plus a massive depression in the ground where the field had been brought level before the grass was put in. Needless to say, getting the Box airborne on 30 meters (100 feet) of line was a real pain. Again and again I launched, only to have the huge kite pass in and out of the wind shadow. Every time, the first lull would bring the kite back to ground. Why not just use more line? I had the bamboo KAP rig attached at the 30 meter mark and was hoping to fly the kite on that length while setting up the camera. It just wasn't happening so I ended up pulling the bamboo tetrahedron a fair way towards the middle of the field. At least now the kite was spending much more time in relatively smooth and fast air. Some high-angle flying at last! But only on 30 meters (100 feet) of line. By this time, time was running out and I had to get home. Lesson 1: Perhaps take the Box kite all the way to the downwind edge of the field right away. No more wind shadow nonsense! If KAP still proves problematic, I will probably make a high-wind version of the Multi-Dowel Barn Door kite. Cut down sail area, double the amount of horizontal spar bow and maybe cut a slot in the sail as per the Delta kite experiments mentioned here recently! Lesson 2: A loose-fitting main spar popped out of its drum at least twice, in flight. Managed to land quickly but gently both times, with no damage. So the design needs a shoe-lace tie for every main spar join after all! Live and learn. It was OK while it was a stiff fit. A final note... The Pentax Optio camera has a panorama feature that stitches three shots together, side by side. It has been easy to use and works well. Earlier today the wind was gusting well over 50kph. Towards evening this had started to settle down, but it was still decidedly 'box kite weather'. A warm and extremely gusty wind from the North was blowing as we arrived and set up. The field was selected due to its roominess in the North-South direction. Behind a tree seemed a good place to shelter while the big blue Box came together. I was hoping to loft a Half-Picavet arrangement for the Skewer KAP Rig. 50 pound Dacron sliding through shiny paper-clips seemed to have adequate strength and slipperiness for the job. A pendulum-plus-drogue approach had been tried and rejected a few days ago! A few short flights ensued as I played with the kite on 30 meters (100 feet) of line. The KAPing was going to be a challenge today! Just a brief lull will bring a box kite right down to the grass, before the next blast of fresh wind comes through. Unfortunately, just after I had the KAP rig attached and ready to go with a test weight, a tear developed in an upper cell leading edge. Now, I had noticed a fault a couple of weeks ago - had I actually repaired it?! Maybe not. That would explain the failure, with the breeze gusting well over 30kph today. So, after some spectacular rough wind flying at low altitude today, it was all over way too soon. By the time I had the kite packed up, the tear had gone almost completely through to the trailing edge of the cell. The kite a picture of un-airworthiness, flapping and twisting about on the ground. Sigh. A rather brief shoulder-height check with the wind meter showed 18kph gusting to 25kph. But the Multi-Dowel Box kite had pulled like never before, indicating mid to high 30s perhaps, higher up. It was looking like a Multi-Dowel Barn Door kite kind of day, with light winds gusting into the moderate range. Just to be safe, I decided to bring along the Multi-Dowel Box as well. This turned out to be a good move, as the tree tops were moving quite vigorously by the time the kite was rigged. The Box kite, that is. Despite the upper-level mayhem it took many tries to get the big blue Box kite up and out of the local wind shadow which covered the launch point. This kite drops like a stone in anything remotely 'light'! But the wind was definitely up there, as evidenced by a huge tree with heavy foliage that takes quite some breeze to show any movement at all. Once again, although the kite was successfully holding its own above 100 feet, there was little chance of lofting the KAP weight in a controlled way. It was 'fly high or not at all'. Smoother air or higher average speeds would be required for KAP. Five winds of looped line around a sign post tethered the kite nicely. A wooden winder was poked through the loop on the ground to prevent unwinding happening from the bottom end of the pole. High up, the rhomboid Box soared around, occasionally emitting furious fluttering noises in the most severe gusts. Winds near ground level were 4.5kph average, gusting to 9.6kph. Online weather stations indicated gusts in the high-twenties up higher. They measure the breeze somewhat higher off the ground - 5 meters (16 feet) at the airport. And I'm sure all weather stations have a fairly unobstructed position with regards to trees, houses and so on. But with thermals active this morning I think the odd sharp-edged gust was over 30kph! Possibly too much for the Barn Door to survive without damage. A quick check with the spring scales had the Box kite's tension pop right up to 8kg for a moment. This was followed by a huge area of sinking air that had the big blue Box right down on the grass just half a minute later. From almost 200 feet above ground. That's when I decided to call it a day! The weather turned out to be very gusty low down, with thermals and strong gusts higher up. Getting the Multi-Dowel Box kite to stay up was a job today! About 8 tows were required to finally get more than 45 meters (150 feet) of line out and the kite flying in clear air. Well at least it was getting me fitter. Flying the kite on 15 meters of line for more than a second or 2 just wasn't going to happen today, so neither did the weight test. More open space is needed! Or in this location, perhaps a different wind direction would do the trick, with fewer obstacles upwind. At last the huge Box kite was sailing away, above 100 feet to begin with. A number of times the big kite started to sag earthward, only to be encouraged back up by some timely pulling in of line. A quick pull-test on the spring scales revealed that some gusts were somewhat over 30 kph, judging by previous experiences. That is, going by line tension and line angle when the kite was in a 30 kph breeze up at Semaphore. The little insulation tape flags were starting to slip. So a few days ago I removed them all and used a black permanent marker to indicate the line lengths. In intervals of 15 meters (50 feet). In the process of marking the line, it was amazing how much the Dacron had stretched since new! So much so, there wouldn't seem to be any point in marking lengths with permanent marker until the line has seen a considerable amount of flying. Sitting on a slight rise near the roadway to the car park, the wind meter registered an average of 6.3 kph and gusts to 19 kph. All up, it was a great flight with moments of 6 kg + line tension and 70 degree or so angles while on 75 meters (250 feet) of line. A few onlookers got some entertainment out of it as well! After the trouble getting above tree-top height I was in no hurry to bring the Multi-Dowel Box kite back down. With the line wrapped around a pole, I eventually walked out to the kite, bringing it down with the aid of a glove. It resisted mightily until at last it contacted, very suddenly, much slower air. When approaching the grass, I pulled on the line to land the big kite like a plane, for a gentle touch-down. Although the afternoon held a threat of isolated thunderstorms, the morning sky was almost cloud-free. The air was pleasantly cool and moving at a moderate pace. So I opted for the big Box kite and headed down to Christie's Beach near Noarlunga. A bit of shelter from the wind makes rigging this kite a lot easier. Hence it was decided to just do it as close as possible to the steep rock face which went right down to the sand, from the roadway above. Finally, the kite was floating over the sand, itching to get away. There was not a lot of space between rocks and sea, but at least the breeze was almost directly down the beach from the North. The line tension was bouncing around between 2 and 5 kilograms. Rough air! Directly upwind, the cause was clear - a jutting piece of coastline and a few trees. At this location the sand is several meters below the 'ground-level' further inland. A lone pelican soared past, heading upwind and taking a look at the kite on its way. The kite was behaving well, so another 30 meters of line was let out. The smoother stronger airflow up there transformed the coils of kite line around my hand into a thin boa-constrictor. A bit squeezy! The spring scales told the story - a steady 4 to 5 kg of tension which occasionally popped to 7kg. After enjoying seeing the kite nailed up there steeply on 60 meters (200 feet) for 15 minutes or so, it was time to head back home. But not before whipping out the camera for another half a minute of video.